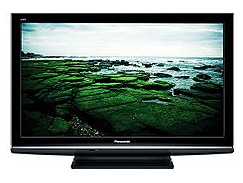 $599 only for the Panasonic Viera TC-P42X1 plasma HDTV at Sears. The VIERA line has a 600hz Sub-Field Drive produces crisp, focused images for sports, dramatic action, and all other fast-moving scenes. Multi devices remote control menus. 30,000:1 contrast ratio super dark blacks, light shining whites. Professional acclaimed razor sharp images. 3 HDMI, 2 Digital audio, 2 s-video, 2 composite. 3D YC and 30000:1 contrast ratio. This HDTV is terrific and even its sound is as good as its image. The Viera TC-P42X1 compares and most of the time outranks most 1080p from Sony or Samsung. It is easy to use, the OSD is a breeze and all plugged in in-out HDMI devices work instantly, so does surround sound which again is pretty impressive. Did I say that the picture quality is fantastic?